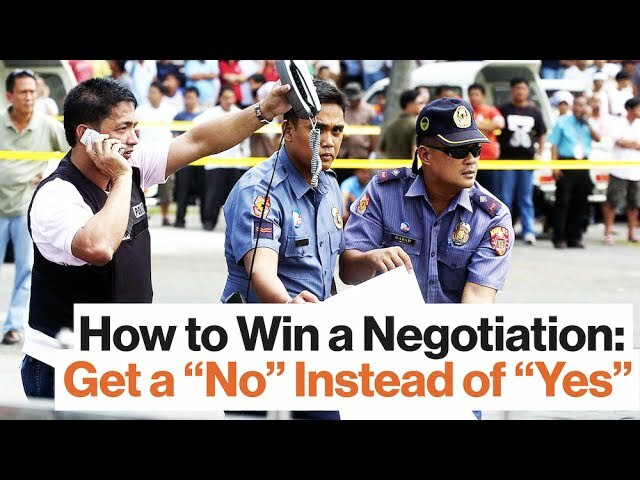 Chris Voss: You know, successful negotiation is not about getting to yes, it’s about mastering no and understanding what the path to an agreement is. Now people are constantly trying to trap us by giving us to say yes. I mean we get hammered on this every single day. Lawyers actually have a term for it they call it cornering. And there’s a theory of negotiation out of there called mirror agreement that says the more little yeses I get out of you the more likely you are to say yes to a big yes. So I don’t know if that was ever true, but I know that we get hammered so much day in and day out with people trying to trap us with yes; trying to corner us; trying to lead us places by getting us to say yes, that we get defensive instantly when someone tries to get us to say yes. So you’ve got to get out of the getting to yes mindset, instead understand that yes is commitment and we’re always worried about what we’ve let ourselves in for when we make a commitment. It’s stunning what people are comfortable saying no to. So first of all understanding that you can use a no to make somebody feel protected and a little more open-minded to hearing what you have to say. Now the second move after that is what do you want them to say next? What you really want them to say is that’s right. You want to be able to summarize how they feel about things and what the circumstances are so that they feel that you got it, so much so that they look at you in the eye and say, “That’s right.” And that’s what we say at any given point in time when we see something that we know is completely true that we’re in complete agreement, we say, “That right!” almost as if we’re so totally behind it. It may even have been a partial epiphany we’re so behind it. We’ve just heard something that we feel is the indisputable true. And in many cases a really good that’s right is summarized in a way that the other person was actually blind to. They didn’t know that those forces were driving them or those passions, but when you say it to them it creates an epiphany on some level where you pointed something out to them that’s true that they didn’t even realize. They’re showing us and telling us that they feel empathy from us. And anytime you feel empathy from somebody else you feel bonded to them. You want to collaborate with them. You want to do whatever you can for them. And that’s a great way to find out what kind of latitude somebody has in a deal. And everybody’s got latitude someplace. What you want to do is put people in a position where they feel connected enough to you that they’re willing to collaborate with you, they’re willing to show you the things that they were scared to tell you about before. The cards that everybody holds in a negotiation that if you could just see those cards you might be able to negotiate a completely different deal. Well, that’s where this entire approach is really going because everybody has cards they’re not showing in a negotiation. Everybody. And if you can get the other side to show you those cards, we call them black swans, the little things that make all the difference, if you can get them to show you the black swans to reveal those black swans then you can probably make a better deal than you’ve ever had in mind.